Harry Potter is midway through his training as a wizard and his coming of age. Harry wants to get away from the pernicious Dursleys and go to the International Quidditch Cup. He wants to find out about the mysterious event that's supposed to take place at Hogwarts this year, an event involving two other rival schools of magic, and a competition that hasn't happened for a hundred years. He wants to be a normal, fourteen-year-old wizard. But unfortunately for Harry Potter, he's not normal - even by wizarding standards. And in his case, different can be deadly. Contains series spoilers. I was excited to read this book. After PoA I was ready to see what JKR had in store and what Voldemort would do after regaining a loyal servant. The HP world got so much more complicated and full of mystery. I remember how truly astounded I was at Barty Crouch Jr being Mad-Eye and the many, many reveals through the book and at the end. -The smattering of information about the Ministry of Magic jobs. I mean, does everyone work there? What does an Unspeakable do for a living? Why do they let Arthur keep is rather useless job? Is no one knowledgeable about muggle clothing? -The whole racism aspect with Hagrid, goblins, and house elves. This wasn't my favorite bit because I like racism but it was an interesting aspect of the world to explore. -I thought the tasks were enjoyable to read about but I don't know how even an 17 year old, fully trained person could have coped with the tasks without some amount of cheating/foreknowledge of the events. -The Yule Ball seemed like a good way to introduce age appropriate romantic stuff and Ron/Hermione as a ship. I thought Viktor's interest in Hermione was sweet. If I had been a young teen, I imagine it would have been great to see the intelligent female attract the athletic popular guy without some gimmick involved. Ron's jealousy is just... well, a sign of why I don't ship them as a healthy couple. -The graveyard resurrection theme was scary and quite good action considering it's not really a strength of Rowling's. This book really fleshes out Hermione quite a bit. She's got the Viktor Krum flirtation and her disappointment in Ron revealing the feelings that are developing there. She's got the House Elf Liberation Crusade, which gets a little tedious if it's given too much focus. And my favourite, the vendetta against Rita Skeeter, in which it is revealed that Hermione is every bit as ruthless as Voldemort when she's been wronged. It was a shame they cut that out of the movie. Voldemort's plot to get Harry to Little Hangleton is pretty Byzantine. Did he need to stall for a really long time gathering the ingredients for his resurrection potion? Why wouldn't he just have Barty go collect Harry from the Quidditch tournament and save himself a lot of trouble? Maybe that's a "why didn't they fly to Mordor on eagles" sort of question. I know this is the start of the books tending really long, and it is indulgence, but its indulgence I enjoy. Rowling draws her world and characters so well, it's nice to have time to see harry being terrible at asking girls out, or on his growing relationship with sirius. This extra time also allows harry to learn some goddamn magic,and actually most of the spells used through the rest of the series will have appeared here. Voldemorts plan is indeed quite nuts. I think if you assume that the cup was a portkey all along and crouch redirected, being unable to create a new one, it helps explain a little why this might have been the only chance to get harry. And man that graveyard scene is just brilliant. Super Creepy and magical. One nice thing that Rowling does is that while most spells are just words and pointing, the most powerful stuff is more mysterious. Had to do the gillyweed so Snape would accuse Harry of stealing poly juice fixins. Chekov's potion. Years after reading it, the Priori Incantatem scene gives me chills just remembering it- I was very moved by the re-appearance of Voldemort's victims and their role in Harry's survival. I think Voldemort's ridiculously complex scheme definitely falls under the "fly to Mordor on eagles" category as wabbittwax suggests above. I usually handwave it away as Voldie being the ultimate drama queen and try not to worry about it too much. I've seen fanfic that tries to rationalize it using vague allusions to the prophecy, for example the three tasks somehow translating into Harry being manipulated to defy Voldemort three times or other super-handwavy stuff. Better to just ignore the illogic, just like we ignore how time turners could solve any problem. This is also the book in which Dumbledore is the most problematic for me, sort of for the same reason. In PS/SS you can rationalize the stone as being a trap. CoS you can say he was genuinely unaware of both the horcrux and the basilisk and was also hamstrung by political infighting offscreen. PoA continues the theme of him being forced into poor security decisions by political infighting, and in any case is essentially Voldemort-free. After GoF he makes decisions I disagree with, but his concern over Harry's connection to Voldie is at least understandable and his tactics have some explicable underlying rationale. Only in book 4 am I really broken out of immersion by how cavalier he appears to be about Harry's wellbeing. Why does he allow the tournament to proceed? Even more, why does he allow Harry to participate? If it's supposed to be a way to draw out Voldemort as in book 1 it's a terribly dangerous method and Harry is left almost totally unsupported not to mention the fact that it gets Cedric, one of the most promising young wizards of the day and one who might have actually been able to help bring about the unity Dumbles and the hat are always on about, killed for no good reason. If the goblet can really be used to trap Harry against his will then it breaks the universe even more than time travel. We're back into LotR eagles territory because you can just set up a "badguy must surrender himself to the aurors or be stripped of his magic" contract. Let's not even get into question of whether the fact that it's possible to use confoundus on an artifact implies some degree of sentience. That line about Dumbledore's eyes flashing in a moment of triumph at the end is great for the series' drama; it engendered endless speculation about whether Dumbledore was secretly bad and was great foreshadowing about Dumbledore's scheme to use Harry to make Voldemort mortal. Maybe Albus is just salvaging what he can from the debacle at the end of the book but getting Cedric killed, Harry traumatized, Voldemort risen without the broader public being aware of this fact, alienating Amos Diggory and any allies he has at the ministry, revealing publicly that a death eater imposter was teaching students for a whole school year and nobody noticed, and then letting that imposter be executed without being questioned seems like a colossal failure on Dumbledore's part and not at all something to be triumphant about, however much it may advance his long-term Harry scheme. 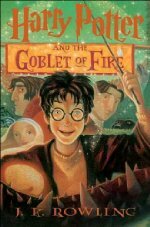 I know a lot of people point to GoF as their favorite book and I agree that there's a lot to love here in terms of character development and humor and story, but it was never my favorite because it strains my suspension of disbelief so hard so often. Yeah, very little of the book makes sense even by wizard standards. Why let a glitch in a magical object force Harry to compete? Why does the competition take almost an entire school year? Why wait until the last minute to kidnap Harry? Why build a plan around Polyjuice Potion, a concoction established to be difficult to produce and short-lasting, when the plan involves constantly drinking huge amounts of the stuff without even having a source of ingredients other than "steal from Snape"? Why steal from Snape when you're fairly certain he's still on your side? Why are portkeys even a thing in a world where adults can teleport wherever they want, taking passengers with them? Is making portkeys everywhere to take people to the quiddich World Cup easier than just making one big floo bonfire? Or flying there on brooms? Inversely, why Hogwarts Express if Hogwarts Portkey is as valid an option? This book's redeeming quality is the time spent on Hermione and Ron, and overall the growing up and learning done by the main cast. Yes, this is the book that so many people waited for. The first three had become a phenomenon, and AFAIK this was the first one with midnight release parties. It was gratifying that it was so large, but I really wish Rowling and her editor had taken the time for one more pass. The pressure was enormous, the books having caught fire and the films in development. The MS was late; Rowling had to throw out much of her work and rewrite because she couldn't get a new character to work (a Weasley cousin). In the first printing, Harry's parents come out of the Priori Incantatem spell in the wrong order! But overall, as has already been noted, the plotting is sloppy and the pacing tends toward the flabby. It takes forever to get to Hogwarts. The Quiddich World Cup is never as interesting as it thinks it is. Winkie somehow manages to make Dobby look like a great character in comparison. The students from other schools are kept so off-limits they end up wasted (except for the Tri-Wizard competitors). The tasks seem like screenplay-ready action set pieces (and not in a good way). By all accounts the book ought to be a massive failure. And yet it manages to be, like Hagrid, lumpily endearing despite its many faults. Spending so much time with our beloved characters is great fun. Letting them fight with each other and struggle with the awkwardness of self-conscious teenage problems was critical to showing their growth, and opens the way to doing so much more in the following books. Why does the competition take almost an entire school year? ... Why are portkeys even a thing in a world where adults can teleport wherever they want, taking passengers with them? The answer to most of your questions are, "Because it serves the writer." The established book structures are based around a fall-to-spring school year, so if you're telling only the story of a segment of a year, then it's not a "Harry Potter book" as the brand trained its readers to expect. Portkeys exist to creat a literary device to whoosh a character to another place, without having to have a character do it to Harry in person, as that would change the relationship that character has to Harry. If you have a character get up close and personal to Harry, then that character must be treated as a significant player, and maybe you don't want that. Crouch and Wormtail are just bit players, not true villains. To be fair, I can totally justify portkeys. Unlike a lot of other travel in the wizarding world, they're safe and reliable. Once you've grabbed hold of a portkey you can't let go. So theres definitely a niche portkeys can fill, by being a simple one shot, safe solution for transporting everyone. I think there is also a mention that other wizards arrived by other means. I get a bit annoyed at this one just because of the legalese around the goblet of fire. Like, the rules of the contest say you have to be over a certain age to compete, but that gets translated into being able to get past an age line to enter, and once you've entered that's apparently fine. Also only one participant per school. But, glitch glitch now we have two. It's evident that Harry isn't meant to be in it. You can claim binding magical contract all you want, but you've clearly set up a pretty dumb contract if it can bind you despite being in breach of the only two rules of the contract and neither party actually wanting to be bound by it. That's not how contracts work. No wonder the wizarding world is stuck in the dark ages if this is what their legal system is like. I wonder if the nonsense with the goblet works better for kids because they're used to adults making (from the kid's perspective) arbitrary and illogical rules. I think it's believable that Harry is just "whelp, I guess I gotta do this because Dumbledore says so, hope I don't die!" It's only when you consider it as an adult that you realize how badly the goblet's magic breaks the world (as I discussed above). So I'm reading this to my son now, and it's only just occurred to me: I've always loved Mad-Eye as a character, he just shines in this book, in so many ways. And yet, it's not actually him. All the care he takes with Neville, all the ways he helps Harry and plays a parental role, how fantastically he put Draco in his place -- and it's just Barty pretending to be him the whole time. The other books don't feature him as much, and yet he still seems to be about the same. Which is strange to me - Was Barty someone who knew him well at some point in life, to be that kind of generous with students? Or was Barty so much more nuanced as a Dark Wizard, and it was a real missed opportunity not to see more about him in later books? I'm really grappling with why this bothers me - I want Mad Eye to be the guy we think he is. But is he? Would he have had the time for Neville? Polyjuice potion won't change your character, but how could Barty have known the man well enough to really inhabit him -- but if he didn't, it really makes it seem like he's the least moustache-twirling baddie in all the books. And that deserves more credit than he gets. I dunno. On the one hand, Moody was an extremely famous Auror and Barty Crouch Sr. was the head of magical law enforcement, so it's extremely likely that Barty Crouch Jr. had a good familiarity with Moody. However, I like to believe that what really happened was Crouch doing his best to act like Moody and finding out that he was actually really good at it, and getting this chance to experience who he might have been if he had stayed away from Dark Magic.